The deck chairs and private plunge pool from one of qualia's a Windward pavilions. Quentin Long reveals what it’s like to honeymoon in complete privacy at Australia’s most covetable romantic luxury resort, qualia on Hamilton Island. There are many theories about where the idea of the honeymoon originated. My favourite – and the least likely, in my opinion – is of Nordic origin. The legend says a honeymoon was the period when a blond hero hid his recently abducted bride from her searching tribe. When the search was abandoned, the blond hero would return to his village with his new and now well-trained wife. Regular readers can enjoy the Nordic part of my honeymoon where I ‘abducted’ my new bride Wolf Creek-style and took her on a four-day honeymoon road trip through the Outback. In complete contrast, this is the ‘perfect’ part for the honeymoon. Want more qualia? Check out qualia reviewed, is it still the best resort in the world and qualia, everything you need to know. 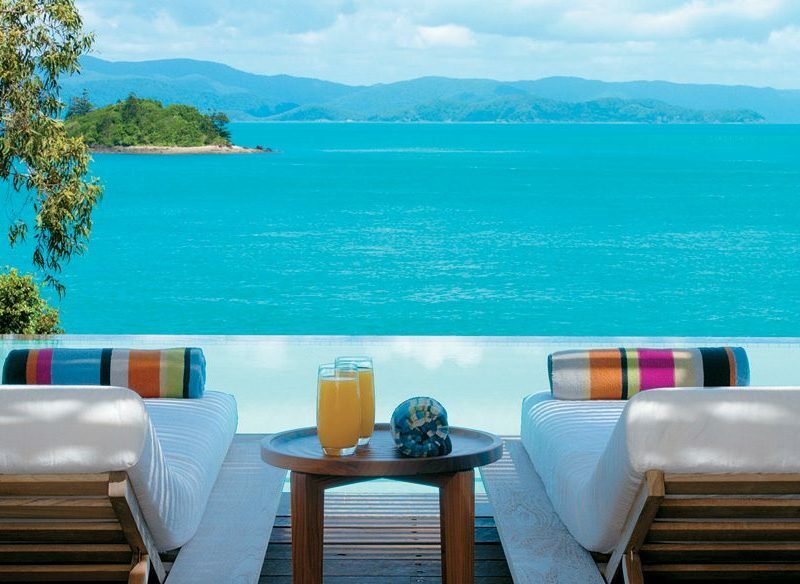 The perfect honeymoon awaits at qualia. Is qualia the perfect honeymoon? The brief for the ideal honeymoon is still pretty simple: it needs to be a self-indulgent, private, no-need-to-lift-a-finger, every-whim-catered-to destination. That’s qualia. The view to Whitsunday island from a windward pavilion at qualia, Hamilton Island. Any more ocean view and you would be wet. Qualia is a 40-pavilion retreat on the northern tip of Hamilton Island. Don’t let preconceptions of the horrible ‘built for Japanese’ Hamilton Island of the ’80s and ’90s cloud your judgment. A lot has changed since the Oatley family acquired the island in 2003. What was once viewed as a nasty, overpriced rip-off has been completely transformed into a sophisticated leisure isle. The signature developments to this evolution are the brand-new Hamilton Island Yacht Club, the 18-hole Hamilton Island Golf Course (actually situated on Dent Island) and qualia, the resort that truly captures the essence of the new Hamilton Island. The bluestone and timber pavilions at qualia are simply amazing. Beyond the wide front door, you enter an open-plan sitting room with a small kitchenette. A comfy sofa and discreet TV are barely noticed in favour of magnificent views out to the Whitsunday Passage through a full glass wall. All 40 of the villas are oriented in such a fashion that you feel like you’re enjoying a private island owned by the love child of Coco Chanel and Giorgio Armani. It’s sophisticated and indulgent without being ostentatious. A bedroom facing out to sea with the bathroom in the background at qualia. Qualia’s north-facing Windward Pavilions come with their own plunge pools overlooking the Coral Sea (photo: Elise Hassey). Each pavilion also has a private outdoor area. An undercover day bed and breakfast table provide respite from the midday sun. For tanners, sun lounges are positioned for maximum melanoma creation. The private plunge pool is adequate in size for those not wishing to do laps, so there is no need to mix with other guests at the resort’s main pool. The facilities included in each pavilion are top-notch. Plug in your phone and your tunes will be piped through all rooms, or you can select which rooms play your music and which ones don’t. The minibar is well stocked, and the complimentary bottle of Mumm for honeymooners well appreciated. All that is why for the first three days of our honeymoon we only venture outside the pavilion for meals. By day, I read by the pool while the wife sleepily mosies from the bed to the plunge pool to the day bed to the lounge to the bed again, in two-hour cycles, before it is again time to eat. We do manage to leave our honeymoon bubble on the fourth day for a private picnic on the beach. 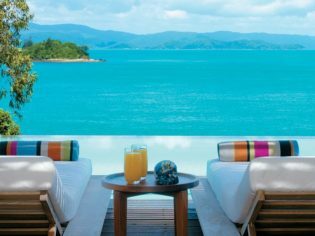 Sunset and champagne for two at qualia’s Pebble Beach? (photo: Elise Hassey). And yes, it is as superb as it sounds. Snuggling on towels under a massive umbrella, we sip champagne, nibble fresh prawns and smoked salmon and wonder how on earth the rest of the world could live without such experiences and one of the world’s most beautiful vistas. That picnic is one of the most memorable moments of our married life to date. One other moment stands out for me. “Did you just hear what you said!” I splutter. The smoked salmon maybe. The place… never. The incredible Whitsunday vistas from the main building at qualia, the Long House. Most guests opt for stays of two to three nights. If you can afford it, four or five is even better and the rates do come down a little for stays of four or more nights. Spa treatments are in high demand: we were unable to book any spa treatments at all for the entire length of our stay, so make sure you book online before arrival, or enquire about availability as soon as you check in. There are two standards of pavilions at qualia: Leeward, which do not have private plunge pools, and Windward, which do. There are two types of bookings, bed and breakfast or bed, breakfast and dinner. There’s also a Beach House for $4800 a night bed and breakfast. All island facilities are included in your room rate, but we doubt you’ll want to venture out. Although you may want to check out the brand-new golf course on Dent Island, where guests at qualia have priority bookings and tee times. qualia does not cater for children. Check out qualia reviewed, is it still the best resort in the world and qualia, everything you need to know.